This is a treatise on the importance of individual freedom, both as an end in itself and as the best means of economic development. It is based on a series of lectures Sen gave in 1996-7, which netted him a Nobel Prize in Economic Science. Nearly two decades later, all of his points seem obvious, but I bet they were revolutionary at the time. His writing is an odd mixture of turgid institutional-ese with occasional hilarious sarcastic asides or brilliantly lucid and forthright sentences. 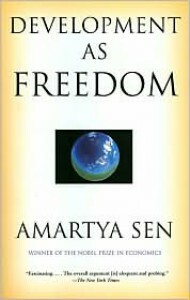 Here's an example of the prose you get upon opening this book: "[To base our choices on reason] we need an appropriate evaluative framework; we also need institutions that work to promote our goals and valuational commitments, and furthermore we need behavioral norms and reasoning that allow us to achieve what we try to achieve." Sen credits the "fast economic progress" of East Asian and Southeast Asian economies to social reforms; he claims that in addition to social reforms having positive economic consequences, "lack of social development can quite severely hold up the reach of economic development." He references studies done in India which showed increased economic growth and overall life expectancy and decreased infant mortality and fertility rate after initiatives to improve female literacy and out-of-the-home employment. Additionally, contrasting states within India, or India vs China, show that providing agency and education to women is more effective at reducing fertility and infant mortality than coercive birth control methods. All of this is a delight to read--it's like being told one can have one's cake and eat it too. Increased freedom and individual agency also prevents some disasters. Sen notes that expending less than 3% of the GNP, or 4-5% of national food consumption, will end a famine, so long as the arrangements are made "in good time." They can be prevented entirely through countervailing government expenditure, particularly in (temporary) job creation. He goes on to say that "Famines are, in fact, so easy to prevent that it is amazing that they are allowed to occur at all. The sens of distance between the ruler and the ruled--between 'us' and 'them'--is a crucial feature of famines." By far my least favorite section was entitled "Social Choice and Individual Behavior," which consists of dismantling several strawmen (It is impossible to rationally derive social choices from individual preferences! All actions have unintended consequences, so trying to do good will lead to evil, while self-interested behavior will lead to good unintended results!) and a tangled mess of Adam Smith quotes to prove that capitalism does too have ethics. Basically, Sen claims that because capitalism requires mutual trust and norms in order to function, institutional structures and common behavioral codes are created and maintained. This in turn means "the developing countries have to pay attention not only to the virtues of prudential behavior, but also to the role of complementary values, such as the making and sustaining of trust, avoiding the temptations of pervasive corruption, and making assurance a workable substitute for punitive legal enforcement." Personally, I don't understand what makes capitalism so special in this regard--people have to trust each other and set up methods by which they can keep each other in check for *any* system to work. But Sen seems convinced. The basic message I took away from this was that instead of measuring development through gains in output, income, or consumption, we should focus on how decisions are made within the society, and what opportunities and freedoms people have. Even if development organizations are only concerned with economic growth, they should keep in mind that if people lack rights (such as the right to education or reproductive control of one's own body) and freedom, economic growth will be stalled.